The Wikification of GIS Education? 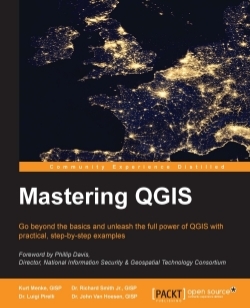 In December 2014 Anita Graser published the second edition of Learning QGIS, which provides a great introduction to the basics of the QGIS platform. Last month I had the pleasure of co-authoring Mastering QGIS with Kurt Menke (GISP), Dr. Richard Smith Jr., (GISP), and Dr. Luigi Pirelli. With all that alphabet soup it's a wonder we had any letters left to write the book... It was an outgrowth of curriculum from the GeoAcademy spearheaded by Dr. Philip Davis at Del Mar College and I think emblematic of our shared interests in furthering access to quality educational materials in the FOSS4G arena. In 2008 Daniel Sui published one of my favorite academic articles titled "The Wikification of GIS and its Consequences: Or Angelina Jolie’s New Tattoo and the Future of GIS." Depending on who you talk in the GIS community the concept - and inherent value - of Goodchild's notion of volunteered geographic information (VGI) varies. And folks get even more feisty about the term neogeography - although some sectors are bit more measured in their response to this term. And it was a comment by Bill Morris about OpenStreetMap that spurred me on to summarize my reflections during the process of contributing to the book. Using a conventional definition for GIS, he identified four areas that would likely be impacted by the rise in wikification: hardware, software, data, and people. Given his connection with academia, it's surprising there wasn't any reference to the impact of this 'web-based mass collaboration' on education. But his ideas about the crowd-sourcing effect on 'doing' GIS are transferable to teaching and/or learning GIScience. I think the more common wiki-based model is excellent for documentation purposes and short tutorials but often those resources are best-suited for folks who already have a background in the fundamentals not novices (I'm not going to make the unnecessary and condescending differentiation between 'experts' or 'non-geographers' versus 'amateurs'). It is easier if you have some experience with GIS to hunt and peck through YouTube videos or isolated online wiki tutorials, to figure out how to create convex hulls or perform a least-cost path analysis in either an updated version of your go-to platform or when exploring - possibly migrating to - a new GIS platform. So educational endeavors like the GeoAcademy the CartoDB Map Academy and even more traditional wiki-based 'getting started' resources supporting Fulcrum, Mapbox Studio, and PostGIS are offering more guidance than just what buttons to click. What's fantastic about this book project is that other than Phil Davis, I haven't met any of my collaborators in person. We followed Sui's idea of 'web-based collaboration' and developed, reviewed, and revised a variety of educational resources to help novices through GISPs engage with FOSS4G options. What's even better is these efforts are spawning folks armed with new resources who are in turn engaging in their own educational activities. This is the cycle we want. I want to yet again re-purpose Sui's claim that "we are witnessing the emergence of a new geography without geographers" and argue we are experiencing a new education model without educators. That being said, there's something very satisfying working through a book to ensure a more thorough understanding of a particular software or database format. I own the first edition of PostGIS in Action (and will order the 2nd shortly), An Introduction to R for Spatial Analysis & Mapping, Open-Source GIS: A GRASS GIS Approach, and The Geospatial Desktop. I haven't had time to tackle the R book yet but even with the University of Google at my fingertips, find myself reaching for bookmarked pages. In the same way that engaging in GIS often involves a quiver of tools, teaching and learning GIS should include a diversified portfolio. I was definitely imagining more than just people teaching themselves and not just following an xMOOC ‘sage-on-the-stage’ transfer model. I see a lot of instances where folks who perhaps don’t identify as educators take the time to share their expertise and experience - historically though platforms like ESRI’s forums (what would I have done without William Huber in grad school?! ), to StackExchange, to even less structured tutelage through Twitter. And that is where i see Sui’s concept of wikification crossover to education; folks with widely varied backgrounds (including the ‘experts’) are learning from one another. I don’t think the success of Mapbox and CartoDB occurred because geographers, GIS Analysts, GIS Admins, geospatial ninjas, (or whatever label you want to use) embraced those platforms and pushed the creativity envelope. More often than not when I’m looking for insight into why my CartoCSS isn’t cooperating or my PostGIS SQL query is bonking in CartoDB, I find help - and learn - from journalists, activists, etc. Bill describes many of the criticisms we commonly hear about crowdsourcing, especially about QA but as I type this response, hundreds? of non-expert volunteers are building a map to inform disasters response to the Nepal earthquake. We often hear a similar criticism of MOOCs (cMOOC or xMOOC alike) about quality control and the risks of letting learners 'cherry pick' their educational pathway. Fortunately higher education can only control the crediting process, not the learning process and students of GIS have an increasingly diverse options for how they 'learn' versus how they are credentialed. Job announcements like this will continue to be more frequent even though the number of traditional GIS programs 'teaching' CartoDB, Fusion Table & RStudio is probably fairly limited (no, I didn't do a comprehensive study, just my experience interacting with folks at regional and national GIS conferences - many programs are dominated by ESRI). So this is what I meant by a new education model without the educators, because being an expert in GIS does not equate to an expert in PostGIS or CartoCSS.